It seems that, so far, there’s been a bit of a misunderstanding of what Prey is. 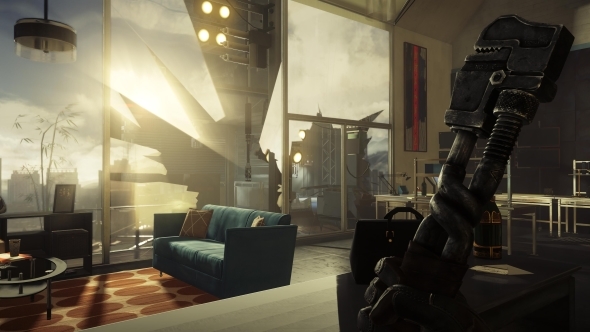 As an immersive sim from developers Arkane, it’s easy to assume it’s Dishonored in space. As a game set in a beautiful art-deco environment that’s descended into chaos, it’s also understandable to think it’s Bioshock in space. But Prey is neither of these things. It’s an unsettling, ruthless game that, in its most chilling moments, echoes Alien: Isolation. And, most importantly, it’s an experience that feels distinctly old-school PC in its makeup. You thought you had to wait years for System Shock 3. Turns out you get it in May. Like your games old school? Here are the best classic PC games still worth playing. Let’s have a quick rundown of why it’s worth keeping Prey on your radar. The heart of its story is a fun conspiracy tale, and it doesn’t waste time getting there. It’s tough and challenging, just like games used to be. The setting is an incredibly atmospheric space station that has a real sense of place. You can jab a needle in your eye to upgrade your brain. DNA splicing will turn you into an alien, if you get too carried away. 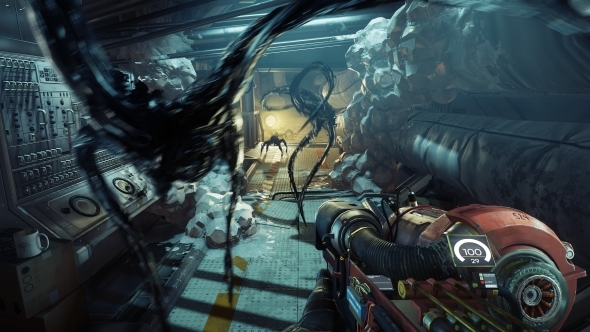 Like the Typhon aliens that act as your antagonists, everything is not as it seems in Prey. It starts as one thing and quickly morphs into something else. So far, media coverage has been restricted to the opening hour of the game, and while that intro is great it’s actually a terrible place to get to grips with what Prey actually is. That initial segment is almost entirely scripted, offering its thrills through massive amounts of plot exposition. You can go elsewhere to have that spoiled if you wish, but it’s essentially akin to having Bioshock’s twist happen at the start of the game. Its message: everything is not as it seems. That’s applicable to both the narrative and the feel of Prey’s starting sequence. By having such a plot-heavy opening, it’s not until later into the game that you start to really get a feel for what Prey is going for. That feeling is one of anxiety, of struggle, and of fear. Prey puts you on an alien-infested space station where no one can hear you scream, and demands you try your absolute hardest to stay alive. It requires tenacity, tactics, and perhaps a few tears. I really wasn’t expecting Prey to be as difficult as it is. You know how it is when you revisit old PC games and you realise how easy things have become since? Prey replicates that feeling. Arkane’s own Dishonored is by no means a walk in the park, but its action/stealth format means that you can leap from building to building while leaving decapitated heads in your wake. Dunwall and Karnaca are open environments with the space to physically approach in any way you see fit. Talos-1, on the other hand, is a confined space station. While it’s not a cramped shuttle – rather, you’re within quite a sprawling complex – its individual areas are small enough to make you feel claustrophobic. You’re locked in with shadowy creatures that can morph into inconspicuous items like chairs and mugs. And, most importantly, these creatures are hideously dangerous. You can’t simply slice a mimic’s head off; they need to be worn down and wiped out. This makes them terrifying. Combating them is a challenge in a way that seems to deliberately hark back to System Shock 2 and the origin years of this complex genre. Like any good immersive sim, you’ll constantly be finding things in the dense environments of Talos-1. But this is a space station for scientific research, not a military compound. You’re likely not going to find seven boxes of buckshot in the filing cabinet of a laboratory. What you are going to find is a collection of lunch leftovers, spools of copper wire, and surplus chipsets. Coming across things that will immediately help you is a rare occurrence, and means when you do find a health pack it’s like opening the shining Pulp Fiction briefcase. You constantly feel starved of resources, and this vastly influences how you play. Simply striding into a room and unloading hot lead into every adversary just isn’t an option since you’ve often only got enough ammo for a handful of carefully considered shots. Plus, with so few health packs, you’re likely to die in extended combat encounters. This is the core difference between Dishonored and Prey; Corvo and Emily are powerful predators who can confidently strike from the shadows. Morgan Yu, on the other hand, is under-equipped and under-prepared, and it makes Prey far more survival horror in its tone. Good checkpointing ensures death is never frustrating, but actually achieving victory is no simple task. Survival requires a great deal of preparation and thought, and that’s where Prey’s fiction and systems begin to mesh. The Talos station relies extensively on recycling, which means every banana peel and frayed wire you find is actually a useful ingredient. You can dump your finds into a recycling station which, after whizzing around for a while, will dump out a collection of Lego brick-like raw materials, ready for use in an item fabricator. It’s a simple system, but it feels like part of a genuine ecosystem that was developed for space-faring scientists, rather than a videogame crafting mechanic. It’s that sense of realism that really makes Prey feel special. Talos-1 is a place. It’s not just got character, but it feels tangible. Built over decades as part of a cooperative effort between the US and Russia, the boastful art deco lobby soon gives way to far more industrial complexes that are clearly inspired by the likes of Russia’s Almaz and Salyut space stations. The game is drawn in that concept-art-brought-to-life style that powers Dishonored, and thus means individual objects look less lavish than in photorealistic games, but this does nothing to dampen its physicality. The station is empty of human life, and genuinely feels abandoned. Not only does that increase its sense of place, but also the feeling that something is deeply wrong. System Shock 2 did this incredibly well with the Von Braun back in the day, and Prey achieves it in a manner that’s almost as pitch perfect as Alien: Isolation’s Sevastopol. It’s not all tooth-and-nail survival, though. Prey has plenty of fun to offer in its combat systems. You’ll likely have seen the GLOO gun in trailers; a sort of expanding foam sprayer that can be used to plug holes in leaking gas pipes and create makeshift ladders to reach inaccessible areas. But it’s also got a combat function: GLOO up a mimic and they’ll be stuck in place for a precious few seconds. It’s enough to beat down their health bar with the wrench, or at least run to safety. 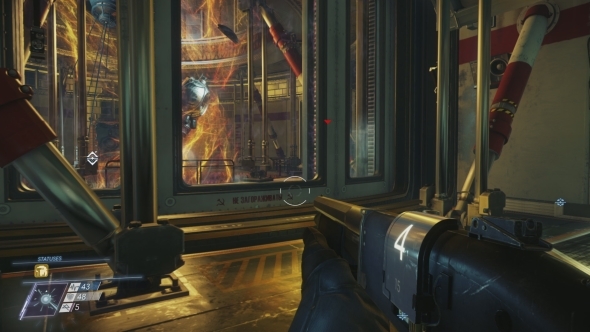 It’s very much Prey’s gravity gun; a tool that feels genuinely multi-purpose, provided the player can think beyond the obvious. The real fun is in the Neuromod abilities, though. By plunging a syringe into your eyeball you can re-wire elements of your brain to unlock new capabilities. There are three schools of techniques. Scientist covers hacking and the effects of health-restoring items. Engineer is dedicated to the repairing and upgrading of items. Security focuses on combat, with skills increasing firearm proficiency and stealth effectiveness. 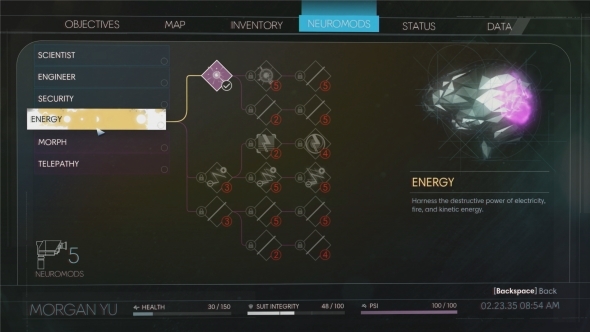 Each progressive skill on the tree requires a number of neuromod units to unlock, and so progress through the RPG system is governed by what you find, rather than grinding for XP. There’s a more tantalising path you can take, but it’s a risk. Those same mods can be used to splice Typhon DNA into your body, unlocking a variety of psychic abilities that can really help turn the tide. They’re split into a further three categories: energy, morph, and telepathy. Unlike human abilities, you can’t unlock them through the use of chips alone. You first need to learn them, and that’s done through the use of the Pyschoscope; a sort of SLR camera lens mounted to your forehead that scans mimics. It’s a slow process, but a completed scan can teach you new skills. Use mods to unlock those skills, and suddenly you have powers than make you increasingly dangerous. As suggested by the name, the morph school of abilities allows you to use the mimic’s titular ability to transform into objects. During my hands-on I experimented with kinetic blast: a bolt of psychic energy that you fire at the floor to generate area-of-effect damage and a knock-back effect. You can even use the knock-back to launch yourself upwards. The system functions akin to Bioshock plasmids, with a separate psionic resource to power these abilities, but it reminds me a touch of XCOM: Enemy Unknown in the way that you gradually steal from the enemy and turn their tech against them. 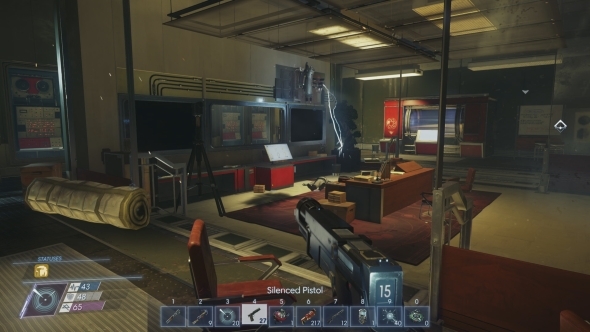 But where XCOM allowed you to totally turn the tables and become an unstoppable force, there’s a complication to deal with in Prey. The more you splice yourself with Typhon genetics, the more alien you become. Take it too far, and Talos-1’s defence systems will identify you as a hostile aggressor and do everything it can to murder you. Is having access to a multitude of extra terrestrial powers worth having to deal with two enemies? While RPG ability systems have been bleeding into all sorts of genres over the last decade, there’s something about Prey’s vastness of choice that feels akin to Deus Ex. Upgrades are not mere inconsequential stat boosts, but gateways to new gameplay opportunities. 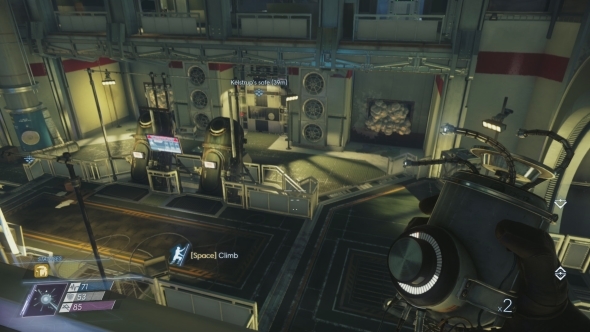 Yes, Prey is releasing on consoles, but aside from one radial menu it doesn’t feel like it. A hotbar at the bottom of the screen has ten slots bound to the 1-0 keys for weapons and powers. You can lean left and right to peek around corners using Q and E. When using keypads, you physically tap the digits you need to enter. Now it exists, it makes Bioshock’s status as a System Shock 2 spiritual successor obsolete. Bioshock shares System Shock’s incredible sense of place and joyous invention, but is fundamentally a shooter rather than an immersive sim. 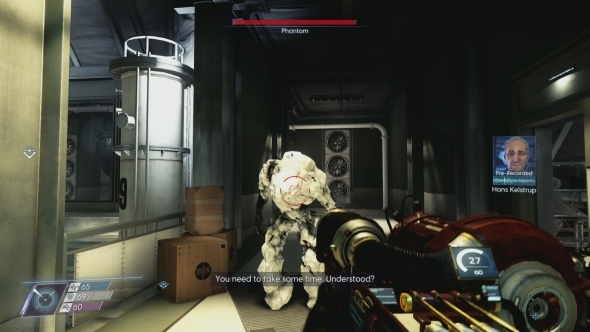 Prey preserves more of Looking Glass’s formula; grid-based inventories, emphasis on stealth and approach, and genuine scares. It’s self-aware of this, too, with a key technology on Talos-1 named Looking Glass. Despite Dishonored 2 being one of the very best games of 2016, there was very little excitement surrounding it. PC optimisation issues didn’t help its cause, but it’s safe to say that it didn’t get the love it deserved. At the moment, Prey feels like it’s in that same situation. From what I’ve seen of it, that needs to change. It’s appears to be a game that deeply honors the traditions of PC immersive sims, reinvigorating them with the extra horsepower and resources afforded by modern day game development. It’s surprising in all the best ways, offering a genuine challenge in a world that feels cold, hostile, and real. Prey is not Dishonored in space. Prey is the game you should have marked on your calendar. It’s out May 5.